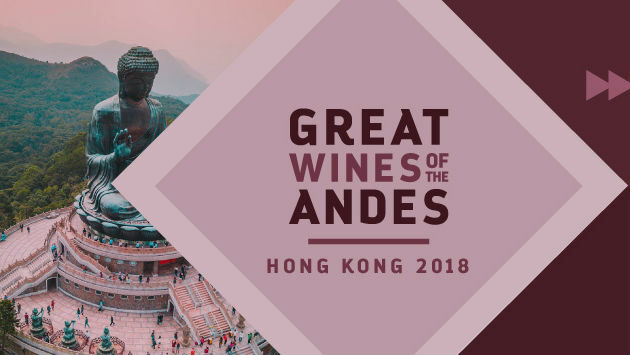 Trade Preview — 4 p.m. to 5 p.m.
Come discover the beauty of Chilean and Argentine wines at Great Wines of the Andes Asia 2018 in Hong Kong on June 1 at the Mandarin Hotel Hong Kong. At this walk-around tasting event, you’ll get to meet and network with 40 of the very best Chilean and Argentine producers. From malbec and cabernet to pinot noir and chardonnay, all of the select wines have scored 90 points or higher. The quality of winemaking is better than it has ever been. Just this February, James and his team of top tasters took off to Chile and Argentina for the sixth time in four years and tasted more than 2,300 wines. The message is very clear to us: a large majority of the wines that are being produced now is of outstanding quality. At last year’s Great Wines of the Andes in the United States, we had a record crowd of more than 2,500 professionals and wine lovers attending the occasion. We unfortunately had to turn away hundreds of wine enthusiasts at the door as well. So, we urge you to get your tickets today before we sell out again! All members of the wine trade are invited to sign up for our free Trade Tasting, and this applies to wine importers, distributors, retailers, restaurant owners, sommeliers, hotel F&B directors. Follow the links below for registration.